In radio interview Sunday, Labor-Hatnua co-chair Tzipi Livni says she would never join party with different path, especially Netanyahu's. Hatnua Chairwoman Tzipi Livni dismissed Sunday the possibility of a unity government with Likud and current Prime Minister Binyamin Netanyahu. Livni is running with Labor Chairman Yitzhak Herzog in a joint list under the banner "The Zionist Camp." During an interview with Guy Zohar on Radio Nonstop, Livni stated openly that she would not sit in a coalition with Netanyahu, despite her party's noticeable drop in the polls. "I will not be a partner in Netanyahu's government. I will not join a path that is not our path," the former Justice Minister, who did sit with Netanyahu as Hatnua Chairwoman in the 19th Knesset, said. Currently, Labor is poised not to win the elections, and is behind Likud by 4 seats, according to the latest poll. This is the first time Livni has stated her intention not to sit with Netanyahu since election campaigns for the 20th Knesset began. "I will not be a partner to a path that is our path, and I am not a partner to Netanyahu's path, or the path shared by Netanyahu, [Jewish Home Chairman Naftali] Bennett and [Yisrael Beytenu Chairman Avigdor] Liberman." "Anyone who does not want Netanyahu as prime minister must vote for us, because every other option is tantamount to [indirectly] supporting Netanyahu," Livni continued. Labor-Hatnua has faced criticism recently for fanning the flames between Netanyahu and the White House over the Prime Minister's planned speech before a joint session of Congress on March 3 - two weeks before Israel's elections. According to Livni, "just as we don't need the Prime Minister to speak before Congress to understand Israel's position on Iran, we don't need to say something [against the speech] for the depth of the crisis to be understood." "Democrat legislators did not need me to support sanctions on Iran and to notify Jewish American leaders that they would not be attending the speech," Livni added. 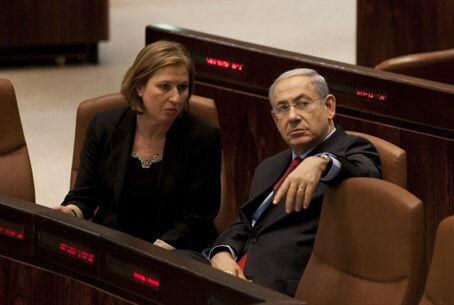 "Netanyahu's actions are unacceptable," Livni charged. "It is our duty to tell the Israeli public that those who speak about security harm Israel's security in the same breath for political needs." "Netanyahu rebukes the world and is unsuccessful at harnessing it to the security needs of Israel."